As we found out last week, the directive has come down from on high at the BBC to ramp up climate alarm at every opportunity they get. 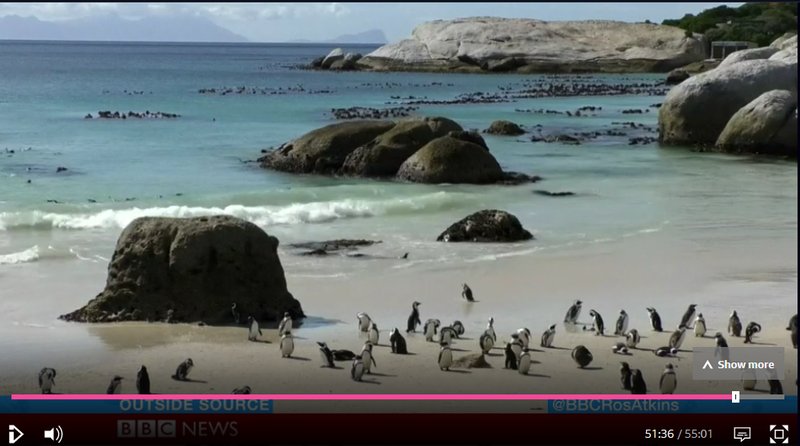 The next report is about the African penguin population and how it’s rapidly declining. Conservationists are saying their habitat is being hit by rising tides caused by climate change. And it’s interesting that since that report by the UN last week on climate change, so many different organisations have been coming forward to emphasise the importance it has on their work. Boulders Beach, home to one of the 28 African penguin habitats. These birds can only be found in S Africa and Namibia. But their survival is under threat, and one of the reasons is there is not enough fish in the sea. The African penguin have to swim far distances to find food, but in the past that was not the case. We suspect this could be from commercial trawling or over exploitation of the food sources of the African penguin. In just three years the number of breeding pairs has dropped by a fifth. Here at Boulders Beach the rangers are encouraging the penguins to use artificial nest boxes, hoping to increase their chances of breeding successfully. This colony is the only place in the world where people can swim freely with these endangered birds. As a result they get millions of visitors every year. Stabilising the population and increasing penguin numbers is a priority here. The aim? That children can see the African penguin in the wild. And, apart from a brief interview with a tourist, who could not believe how close she got to the critters, that was it! There was not a single mention of climate change or sea levels or tides from either the rangers themselves, who are the experts, or from the BBC’s reporter, Philippides. So why did the presenter even mention it at the start, never mind fail to even acknowledge the very real and obvious problem of over fishing? Surprisingly nobody mentioned either the very real threat to the penguins well being caused by “millions of tourists getting close up”. But apparently “letting children see them” is more important. Simon’s Bay has wide, sandy beaches, with plenty of rocky outcrops. The idea that an increase in sea level of less than an inch a decade could make the slightest difference to the penguins’ nesting sites or general welfare belongs on Jackanory, not a supposedly serious news programme. Breeding no longer occurs at 10 localities where it formerly occurred or has been suspected to occur. The present population is probably less than 10% of that in 1900, when there was estimated to be about 1.5 million birds on Dassen Island alone. By 1956 the population had fallen to roughly half that in 1900, and had halved again by the late 1970s, when there was an estimated 220,000 adult birds. By the late 1980s the number had dropped to about 194,000 and in the early 1990s there was an estimated 179,000 adult birds. Given an annual rate of decline of about 2% per year, there is considerable concern about the long-term viability of African Penguins in the wild. By the late 1990s the population had recovered slightly, and in 1999 there was an estimated 224,000 individuals. The African Penguin is now classified as Endangered by the IUCN, and is listed in Appendix II of CITES and the Bonn Convention for the conservation of migratory species. The reasons for the significant decline in the African Penguin populations are well known. Initially, the decline was due mostly to the exploitation of penguin eggs for food, and habitat alteration and disturbance associated with guano collection at breeding colonies. These factors have now largely ceased, and the major current threats include competition with commercial fisheries for pelagic fish prey, and oil pollution. Other threats include competition with Cape Fur Seals for space at breeding colonies and for food resources, as well as predation by seals on penguins. Feral cats are present and pose a problem at a few of the colonies. African Penguins also face predation of eggs and chicks by avian predators such as Kelp Gulls and Sacred Ibises, while natural terrestrial predators, such as mongoose, genets and leopard are present at the mainland colonies. It is obvious that BBC presenters have been told to get a plug in for climate change, whenever news items like these come along, regardless of how tenuous or outright incorrect the link may be. People are far more easy to manipulate than we would like to admit. If you can make people fearful or anxious about something, you can then manipulate them, and if you have a compliant Media, it’s just so much easier. “It is the absolute right of the State to supervise the formation of public opinion”……Joseph Goebbels. The people who govern us keep us fearful, so that we are malleable and easily persuaded to go along with their decisions. In effect, we are being ‘Farmed’…..like sheep.